There’s probably nothing more comfortable than your home. And these two made me feel right at home as soon as I showed up to take their photos. 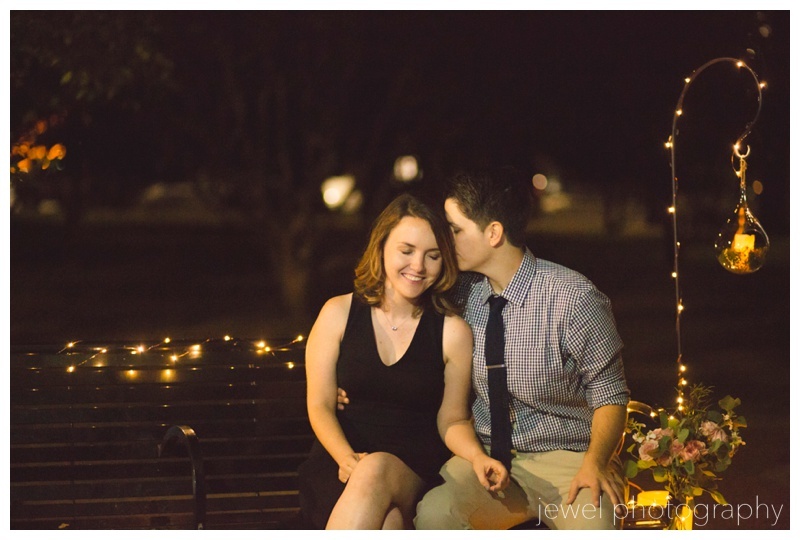 Nicholas and Breeanne’s engagement photos are special because they take place where the wedding will be held in Loomis, CA. This is the property of the bride’s parents, and also where they were married long ago. I think it is so sweet to get married in the same place your parents were, and take formal photos where they did as well. What a special tribute to love! This property is so beautiful, and at this time of year full of wildflowers and lush greenery. We decided to go off to some remote areas that we will probably not be able to get to during the wedding. This was fun and I can see why these two are a couple, they have great chemistry and are constantly smiling at each other. I’m so excited for the wedding! The property was full of huge boulders…who wouldn’t want hiking in their own backyard! A meadow of purple wildflowers? Yes please! Of course we had to take photos on the rusty old tractor! My family actually had one of these on our little farm growing up. 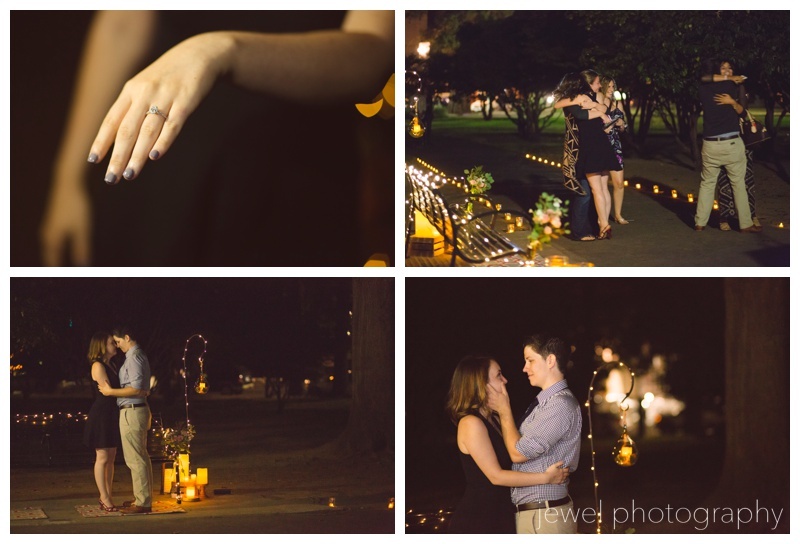 This wedding is going to be so beautiful…I can’t wait! This spring has kept me busy! From engagements, to high school senior portraits…this beautiful weather and rain have made for some colorful photos. I love finding new spots around the American River, there are so many great paths to take. Here are a few shots of wildflowers I grabbed during recent escapades. So far I have managed to avoid ticks, mosquitos, and snakes. Knock on wood! I won’t be leaving my bug spray home quite yet. I am really thankful for my clients that trust me to take them out on little mini adventures. 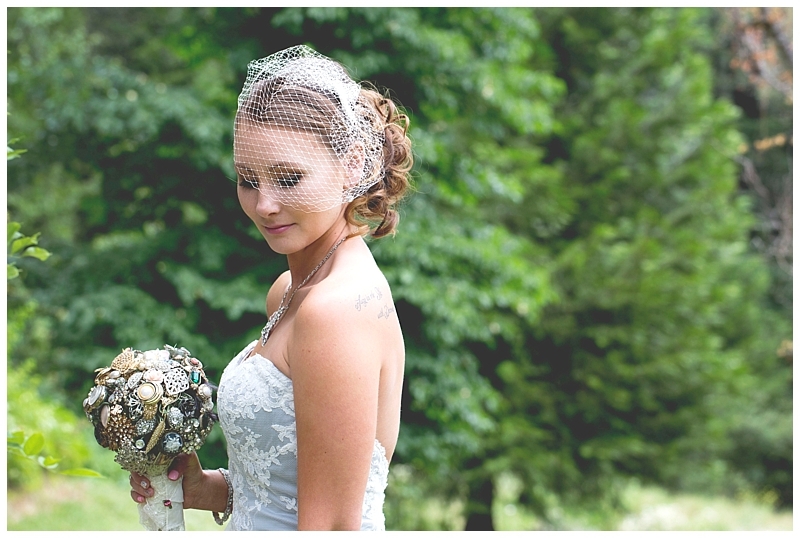 I can’t wait to blog about more photo shoots and weddings (past, present, and future! )…stay tuned! This is a path at the Effie Yeaw nature center. What a great place, I highly recommend visiting this state park, especially with kiddos, there is so much wildlife to see! I wish I could identify some of these wildflowers! If only I wasn’t so busy being a photographer, I could go back to my botany roots and try to remember some of these flower names, or at least bring a California native book along with me! Sometimes I get to bring a little helper along too. Which is kinda nice 🙂 These photos are taken along the American River near Sacramento State University, where I just happened to graduate from. It was such a fun place for the family to run around and for us to get some great senior portraits. This senior happens to be Argia’s cousin. Alyssa is off to UCSB…exciting! If you have any fun spots you would like to take photos at, let me know! I love new locations (and hunting for wildflowers)! Or just contact me at jewelphotographysacramento@gmail.com! On Valentine’s day, our little family decided to go up to the snow for the day. I had a few spots in mind for taking photos. One of them was Donner Summit Tunnel…except we played a little too hard the first half of the day and our 5 year old fell asleep before we could get to the tunnel. I wanted to set up a tripod and take a romantic little photo of me and my husband in the snow for V-day, but we didn’t quite get to that part! I did take some other photos that I thought everyone would enjoy. We love our little family road trips and feel very lucky to live in such a beautiful place as Northern California. To see more of my photos, click here. To schedule a snow session, click here! Recently, I was contacted by another photographer in Tennessee who goes by “Jewels Photography.” A year ago she obtained the federal trademark on that name (without notifying other businesses already operating with that name). These other businesses (mine included) have been busy building great reputations for many years and she’d like to reap the benefits by expanding into our geographical regions. At least one of these businesses has a good chance to have this Tennessee photographer’s trademark overturned–turn around is fair play, right?!!! Well, I decided, “Why get bogged down in this mess, even if I’ve got a regional claim to the name?” Besides, I’d much rather spend time with my clients! UPDATE: I am still operating my business as Jewel Photography. I have worked hard to gain SEO in my area and I have put a lot of time and effort into my business so I will keep running it to the best of my ability. This means put time into taking care of my clients instead of worrying about changing my business name! I left it up to Jennifer & Jeremy to pick a spot for their engagement photos, and they did a great job in finding a beautiful location just outside of Woodland in Yolo county. Windmill Farm & Vineyard is a quaint wedding venue and it was so nice to be surrounded by olive orchards and grape vineyards. There are barns and tractors, old fences and an old porch to sit on while you gaze out at the rolling hills. This is a great spot for a country vineyard wedding! We started by the pond and worked our way up the road to watch the sunset behind the hills of Northern California wine country. Their dog Indiana joined us, and he was very willing to take photos. Windmill Farm & Vineyard has beautiful views in every direction! I can’t wait to go back someday and take more photos! And I cannot wait for Jennifer and Jeremy’s wedding day! If you would like to see more of my portfolio, please visit my website! I met with the brideLindsey and her mom early last year to go over the wedding details and I think we ended up laughing the entire meeting, so I knew the wedding would be fun. As a wedding photographer, it’s so nice to relax and enjoy yourself and it’s also great when your client feels comfortable around you. The wedding was in Folsom at Lake Natoma Inn. The hotel backs up to a beautiful spot on the American River. We only had a short time for photos before the sun went down, so we went down to the river path and let Lindsey and Trevor have a little alone time before the big party started. The two of them were so cute together. You could see the happiness when they looked at each other. Lindsey had told me they liked to joke around a lot, but there was sure a lot of romance happening on their big day! I personally believe that the wedding album is one of the most important things you should consider when choosing a wedding photographer. This is why I give all of my clients a wedding album. This gives them a tangible piece of their day…to have forever. Trust me, it is much harder than you think to design a beautiful and professional album! I show my brides and grooms a sample album, but here are a few photos I took of one album from last year. It is much better to see in person, but at least this gives you an idea of how nice these are. They are so heavy and the thick pages with luster finish make the photos look amazing. You will be happy to show off this gorgeous leather wedding photo album. Another favorite of mine is the linen cover with a picture window. I also like the hardcover, so the photos can be printed right on the album cover. I let my couples choose the photos for their albums and then I design them with their wishes in mind. Each wedding album is a piece of art and also a piece of history! Check out more of my wedding photography here. I am in Sacramento, but I also travel all over Northern California for weddings! Corrin had been planning for months. Rachel had no idea. This park bench was where they shared their first kiss. 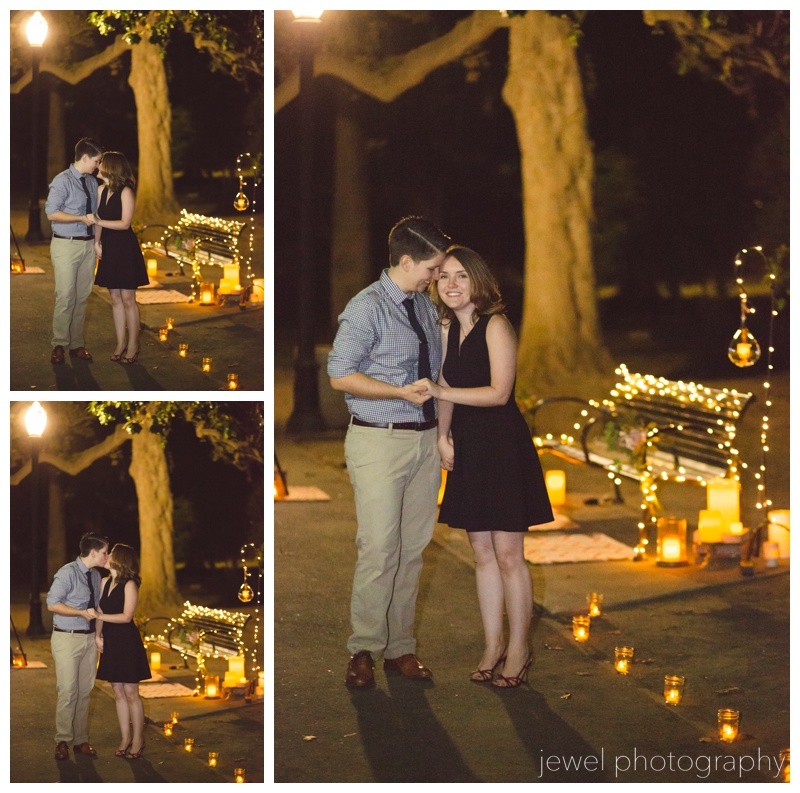 It was adorned with thin copper twinkle lights, flowers and candles. If that is not romantical, I don’t know what is. When I saw Corrin’s request for a photographer, for some reason I knew I had to do it. Just like fate brought Corrin and Rachel together, fate allowed me to meet them and capture one of the happiest moments of their lives. Corrin was getting nervous, but friends were there for moral and technical support. Rachel thought they had a birthday surprise for her, so after a day of pampering, her friends brought her to the park where she found a pretty lit up bench and a little video to play on an iPad. Things went off without a hitch as Corrin peeked from behind a tree. 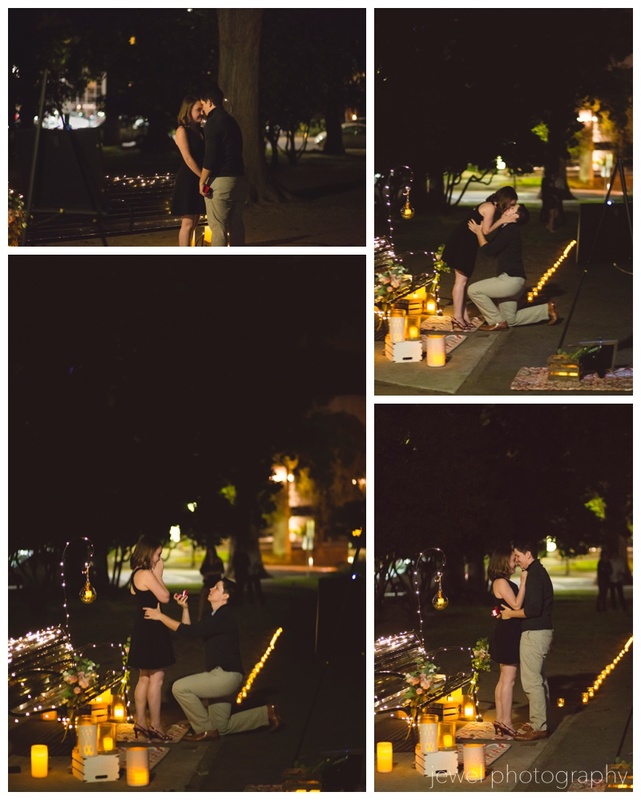 And most importantly of all, SHE SAID YES! Everyone who walked by thought it was just the most awesome thing…because it was! 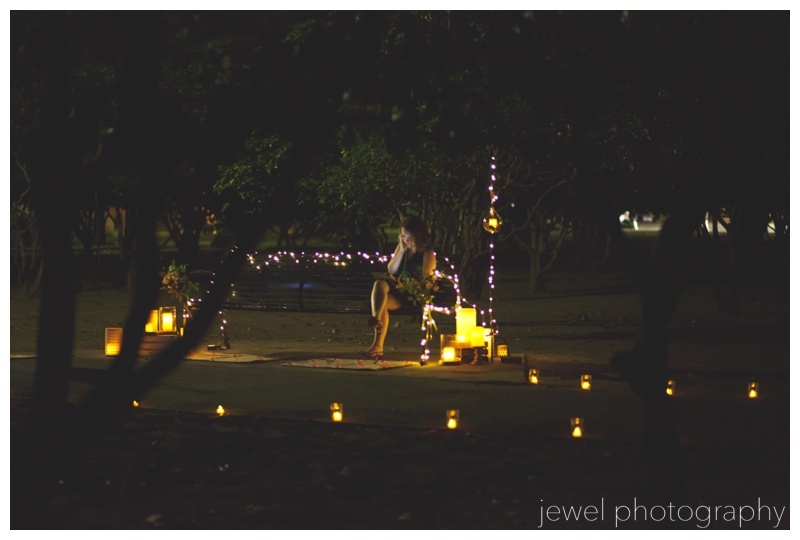 Not only did Corrin have the perfect setting with the bench lit and decorated with flowers and candles…she also had a poem she wrote Rachel typed up and framed. 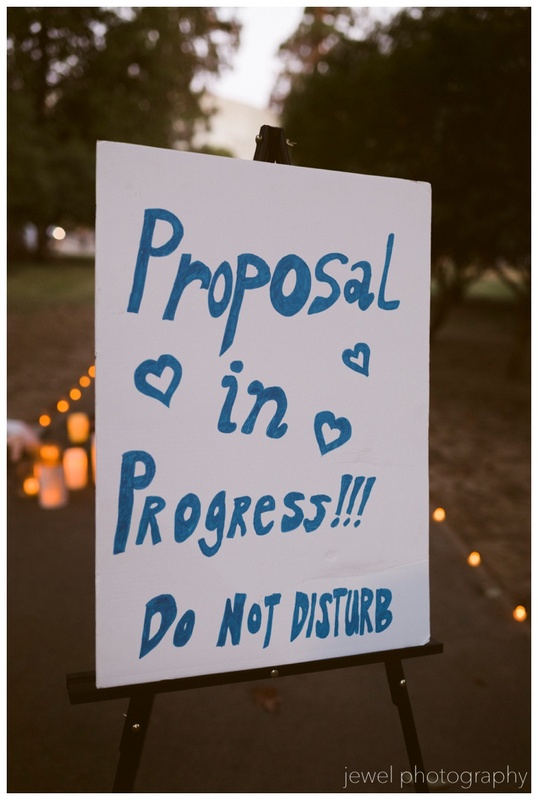 What a thoughtful and romantic gesture! Rachel’s friend’s escorted her to the “birthday surprise.” I think she knew it was something more special. Rachel watched the special video made for her on the iPad, while Corrin anxiously awaited. If my heart was pounding, I can’t imagine what was happening to theirs! In the little time I have known them, they are just awesome people. I am so happy for their love! Many many heartfelt congratulations to these two! I recently met some friends out at the UC Davis Arboretum for some multiple family photos. I love the Arboretum for all it has to offer. Every photo shoot looks completely different because of it’s enormous size and varying vegitation. The kiddos had fun running around and we got some beautiful photos at sunset. Sometimes (when you are a photographer), it is ok to mix business with pleasure! View more of my galleries here! Several months ago I was able to step away from wedding photography and do what I absolutely love, which is spending time with a brand new baby. 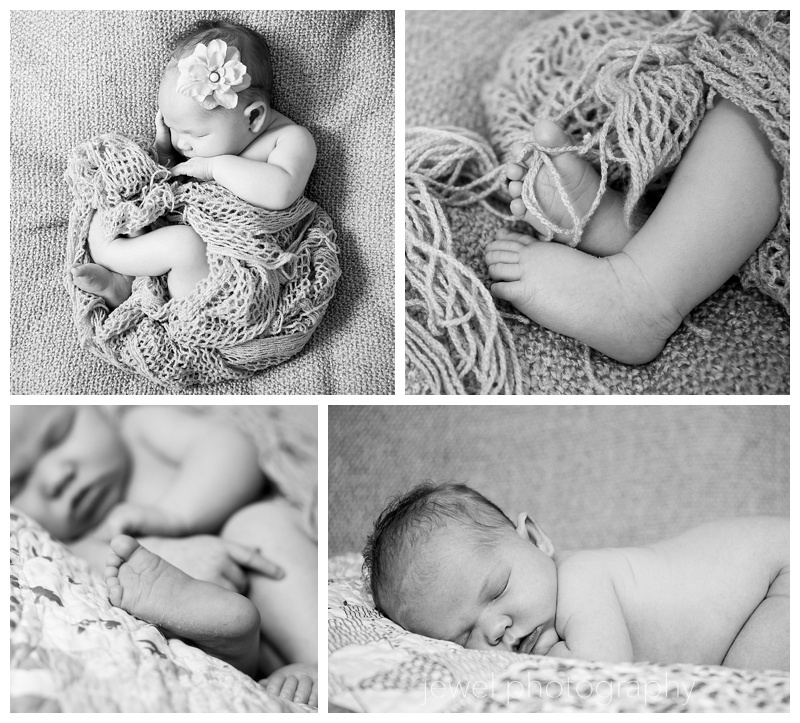 The second perk was getting to photograph this beautiful newborn and her family. The mommy is a very dear friend of mine, as is the daddy and vivacious toddler. Times like these make photography not exactly feel like “work”. Margot slept like a baby for me, and I was absolutely thrilled to finally meet her! 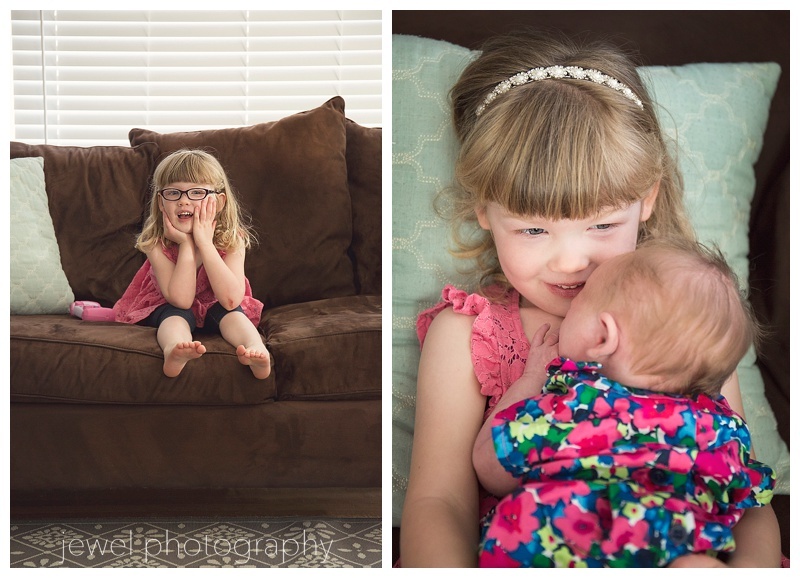 Emerson was ready for the task of being a big sister. A mother’s love is a joy to capture. 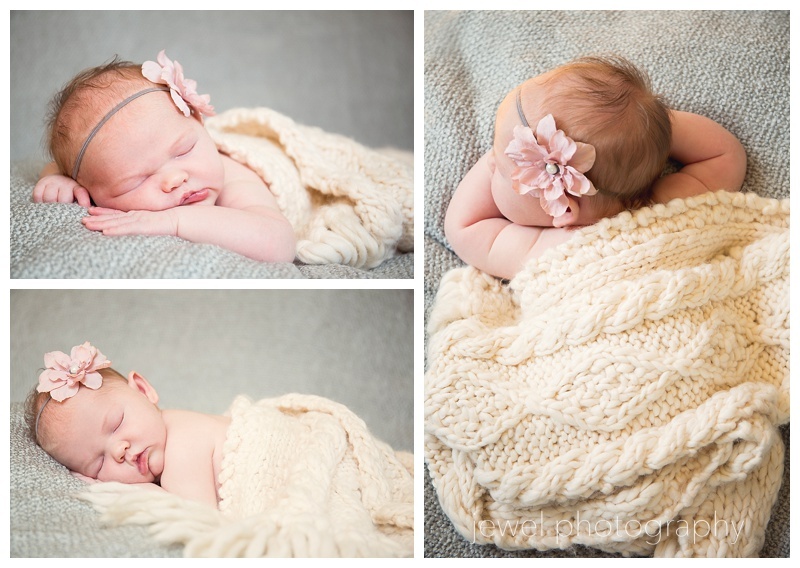 Baby Margot is a sweet and healthy girl, what more could you ask for? Leigh Ann decorated her nursery in corals, grey, and white (with a hint of gold). This beautiful quilt tied everything together. The little details were so perfect! Newborn babies are so tiny and they grow so fast. Pretty soon those feet will be running all over the place! The new member of the family. 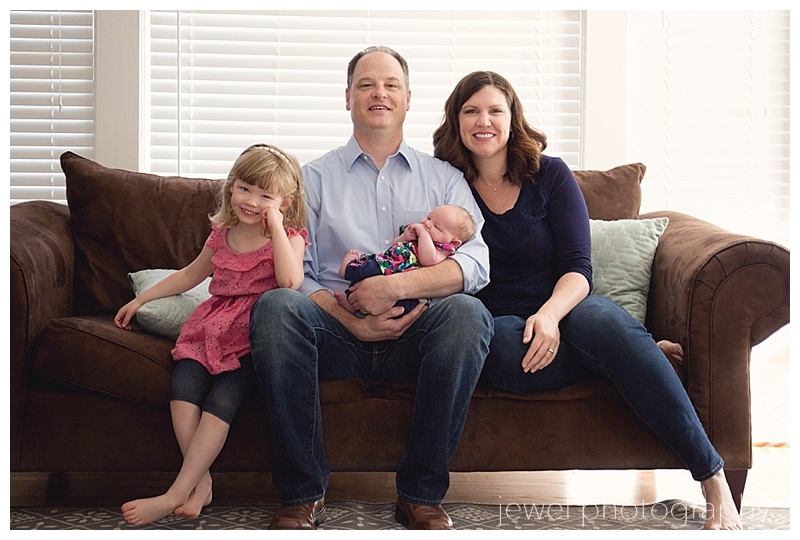 I love lifestyle photography, where I can come in to your home and make real memories. More of my work can be seen here.